Submundo do Som - Who is rapper Ron Solemn? What is your rap trajectory up to here? Please introduce yourself, dude. Ron Solemn - How's it going? My name is Ron Solemn, I'm a rapper and singer from New Jersey. I started making music in 2013, just as a singer, covering popular songs such as "All-Star" by Smash Mouth and "With a little help from my friends" by the Beatles. I posted these on YouTube and shared them around. Once in college I met others who also enjoyed making music and this led me to keep growing and improving. In 2016 I started rapping for the first time and I fell in love with it, and that's when I became a rapper and singer. Submundo do Som - What does the name Ron Solemn mean? Why did you chosse this rapper name? Ron Solemn - Ron Solemn is a name I took on in 2017, I started thinking of it a few months earlier. I chose it because it flows well and relates to part of my personality. Solemn for the content of my music, the serious topics and grim subject matter. Also, it means sincere and honest, regal. I like to be honest about myself in music and my life so it speaks to my principles. Submundo do Som - What are your influences and and inpirations to make rap? Ron Solemn - My influences and inspirations in music are classic Motown, like the Temptations, Stevie Wonder, the Jackson 5, etc. All quality soul music that I grew up on, and the reason I love singing. I like to utilize this influence in my music. In terms of hip hop, early Kanye West is definitely my biggest influence. I've listened and enjoyed all of his albums so far, and the way he told stories made me love rap. I like to tell stories in my music and keep it continuous and meaningful. I don't like Kanye West's support for Trump , so I probably won't listen to his next album. He was definitely an influence in the past. Submundo do Som - Besides rhyming, Ron Solemn is also a singer, correct? This diversity help doors in music? Ron Solemn - Yes, I am a rapper and a singer which definitely allows for versatility in my music. I am capable of making various forms of songs, from hip hop, to trap, R&B, rock, alternative, and indie...I can sing for multiple songs and have a more calm, peaceful sound, while also making hard trap bangers. This allows me to appeal to multiple demographics and spread my sound anywhere. Submundo do Som - How is the Hip Hop scene in the USA for the guys that are starting? Ron Solemn - The hip hop, rap scene in the USA right now is very saturated. The establishment of mumble rap and autotune has allowed anyone and everyone to believe they are capable of being musicians and rappers. It's hard to find someone who DOESN'T make music nowadays. This is also unfortunate because a majority of music on the radio over here is unoriginal and people copy each other's sound. The songs lack content and meaning as well, all about drugs, money and meaningless things. Rap has become somewhat of a joke now and its looked down upon because everyone is involved in it...so I'm trying very hard to stand out for my content and show that I actually love the art and have important messages to relay. Submundo do Som - Today's rap is different from rap of the 90's. Many lyrics no longer have the protest. Do you think that's right? Or do we have to take root again? Ron Solemn - I respect everyone's right to experimentation and creativity, so I respect the ability to rap about whatever you want in music, so I don't bash anybody, but there is plenty of protest and meaning in music nowadays, artists like Kendrick Lamar and J.Cole, J.I.D. etc. have protests going on in their music and lyrics and they are very popular right now, so there's a small balance of mumble rap , and minimalistic trap with true lyrical rap. 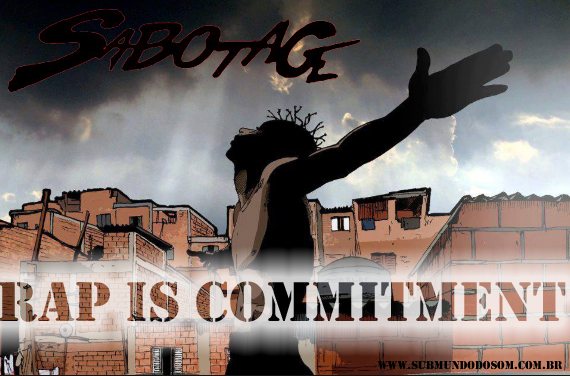 Submundo do Som - In the Brazil has a rapper called "Sabotage" (in memorian), who has a motto, which is very famous in Brazilian hip hop, which is: "Rap is Commitment", do you believe in that phrase? Ron Solemn - Yes, rap is definitely commitment. You commit to the art form and your love for it, and constantly trying to improve your skills, compete with yourself to become smarter, faster, wittier, and just a better lyricist over all. Always dedicated. Submundo do Som - What are your dreams in the rap? Ron Solemn - My dreams in rap and music in general are to become an established successful artist with a fanbase all over the globe, and to put out revolutionary music with progressive and unique messages, leaving a known and respected legacy for my family and loved ones. I want my name and ideas to be known, revered and remembered for the good, and for my descendants to be financially taken care of and successful, and happy. Submundo do Som - In your area, is It easy to happen Hip Hop events? Ron Solemn - It's definitely not hard to set up hip hop events as there is a large population of fans interested in the genre. Many of the events around me though aren't for rap, they are for rock and acoustic indie. Hip hop events are really hard to find but not to start on your own. Submundo do Som - Man to finish, what message do you leave for the guys who accompanied this interview? Ron Solemn - My message is to always stay persistent with your goals, map all of your plans out and break them into small accomplishments. Thats how you keep getting bigger. Also, being an artist can be pretty lonely when it seems like no one around, even loved ones, are supporting you. Just stick to your dreams and work consistently, you'll achieve and find the right people. Submundo do som - And what your communication channel, for the guys who want to follow the job the Ron Solemn? Submundo do Som - Quem é o rapper Ron Solemn? Qual sua trajetória no rap até aqui? Se apresenta pra nós mano, por favor. Ron Solemn - E aí firmeza? Eu sou o Ron Solemn. Sou rapper e cantor de Nova Jersey. Eu comecei a fazer um som em 2013, fazendo cover de sons conhecidos como "All Star" da Smash Mouth e "With a little help from my friends" dos Beatles. E postei no youtube e teve uma aceitação legal. Na escola conheci outros manos que também curtem fazer um som, e isso me motivou a seguir melhorando e crescendo. No ano de 2016 eu fiz rap pela primeira vez, e foi amor a primeira vista. Então passei a ser além de cantor, ser rapper também. Submundo do Som - E o nome Ron Solemn? De onde veio e o que significa? Ron Solemn - Ron Solemn é um nome que assumi em 2017, Eu comecei a pensar num nome alguns meses antes. E escolhi esse por que soa bem e tem a ver com a minha personalidade. Solene pelo conteúdo da minha música, meus temas são serenos. Também significa que as ,músicas são sinceras e honestas. Eu curto levar a vida na honestidade e de modo sincero, e minhas músicas são inspiradas na vida. Submundo do Som - Quais são suas influências e inspirações para fazer rap? Ron Solemn - Minhas influências e inspirações na música são os clássicos da gravadora Motown, curto o Temptations, Stevie Wonder, os Jackson Five, etc. Tudo som da hora da soul music que cresci ouvindo e que me motivaram a começar a cantar. Então essas são as influências que coloco na minha música. Falando de hip hop, o Kanye West é minha maior influencia, sou fã dele, curto todos seus discos, e a forma dele de contar histórias me faz amar o rap. Eu curto contar histórias nas minhas músicas e mante-las de uma forma significativa e da hora. Porém mano, eu não engulo esse apoio dele ao Trump, então nem vou ouvir seu próximo trampo, ele foi uma influencia do passado. Submundo do Som - Além de rimar, o Ron Solemn também é cantor, essa diversidade ajuda abrir portas na música? Ron Solemn - Sim, eu sou rapper e cantor e isso de fato traz uma versatilidade para meu som. Eu sou capaz de fazer vários tipos de som, do o hip hop, ao trap, R&B, rock, alternativo e música indie...Eu posso fazer diversos tipos de som, dos mais calmos aos mais agressivos como um hard trap. Isso me permite apelar para vários dados demográficos e divulgar meu som em qualquer lugar. Submundo do Som - Como é a cena do hip hop nos Estados Unidos para os manos que estão começando? Ron Solemn - O hip hop, a cena do rap nos Estados Unidos hoje está muito saturada mano. O uso de mumble rap e do autotune faz com que qualquer um acredite que é um rapper. é difícil encontrar alguém que não use essas paradas hoje em dia. Isso também é lamentável, porque a maioria das músicas no rádio daqui não é original e as pessoas copiam o som um do outro. As músicas também não têm conteúdo e significado, tudo sobre drogas, dinheiro e coisas sem sentido. Rap tornou-se um pouco de brincadeira hoje e é menosprezado porque ta cheio de qualquer um...Eu me esforço muito para me destacar e mostrar que realmente amo a arte e tenho mensagens importantes para serem transmitidas. Submundo do Som - O rap de hoje é diferente do rap dos anos 90. Muitas letras não têm mais o protesto. Você acha isso mesmo? Ou temos que nos enraizar novamente? Ron Solemn - Mano, eu respeito o direito de todos de experimentarem e serem livres para criar, então eu respeito o que cada um quer fazer na música, mas nem tudo que eu curto manja? Mas ainda há muitas músicas de protestos e com significado hoje em dia, artistas como Kendrick Lamar e J. Cole, JID etc, os caras têm protestos em suas músicas e letras e eles são muito populares no momento, então há um pequeno equilíbrio de mumble rap e trap de tiração de onda com a verdadeira lirica do rap de mensagem. Submundo do Som - Aqui no Brasil tem um mano, o rapper "Sabotage" (in memorian), que tem um lema, muito famoso no meio do hip hop, que é: "Rap é Compromisso", o que você acha mano? Rap é compromisso? Ron Solemn - Claro! rap definitivamente é compromisso. Você se compromete com o seu amor pela arte e pela sua arte, e constantemente tentando melhorar suas habilidades, competir com você mesmo para se tornar mais inteligente, mais rápido, ter melhor lirica, e ser um melhor letrista observando tudo ao redor. Sempre dedicado. Submundo do Som - Quais seus sonhos no rap? Ron Solemn - Meus sonhos no rap, e na música em geral consiste na busca por me tornar um artista de sucesso e com uma base legal de fãs em todo o mundo, lançar músicas revolucionárias e com mensagens progressistas e da hora, e deixar um legado bem foda e ser respeitado, dar uma estabilidade para minha família. Quero que meu nome e minhas idéias sejam conhecidos, reverenciados e lembrados para o bem, e que meus descendentes sejam financeiramente bem-sucedidos e felizes. Submundo do Som - Aí na sua quebrada como são os eventos de hip hop? Ron Solemn - Mano, sem dúvidas não é difícil criar eventos de hip hop, pois a galera é fã e interessa ​​no gênero. Muitos dos eventos na quebrada não são de rap, são de rock e de indie acústico. Agora eventos de hip hop é mais embaçado pra se achar, mas não é difícil para criar algo por conta própria. Submundo do Som - Pra finalizar, que mensagem você deixa pros manos que acompanharam esse bate papo? Ron Solemn - Mano, a ideia que dou é que sempre seja persistente, tá ligado? Corra atrás de seus objetivos, mapeei todos os seus planos e vá por partes. É assim que você se mantém crescendo. Além disso, ser um artista pode ser foda, quando parece que ninguém ao seu redor, nem mesmo aqueles que te amam, estão te apoiando. Apenas atenha-se aos seus sonhos e trabalhe consistentemente, você alcançará e encontrará as pessoas certas. Submundo do Som - E quais os canais de comunicação do Ron Solemn? Pra quem quiser acompanhar seu trampo como faz?